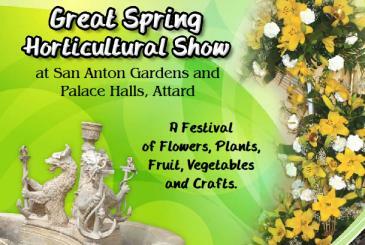 The Malta Horticultural Society proudly presents its Annual Great Spring Show. In its 110th year, this fantastic show is a fun family event and will span over the weekend of the 4th and the 5th of May 2013. Gaze in awe at the hundreds of stunning flower arrangements all made with care, creativity and passion from society members. The flower arrangements on display during the festival are truly works of art. During the show, visitors will also have the chance to see local fruit and vegetable displays as well as delicious homemade preserves. Local honey and olive oil will also be on display. If you love hand crafts, you will also be able to follow and admire various demonstrations on local crafts during the show. Visitors to the Maltese Islands enjoy this lovely show because here they have the chance to see and appreciate another side of Malta. San Anton Gardens are one of the most beautiful public gardens on the Maltese Islands. Visitors love to wander through the lovely walkways and admire the many sculptures, fountains and ponds that adorn these gardens. In these gardens, you can also see countless numbers of trees and flowers from around the world. Admission is 2 euros. Children under 12 Free of charge. Very nice, I might go and check this out!